J70s: Allan Stern and Bill Walker of Westport, skippering Victura, won the Long Island Sound Championship in the popular J70 sport boat class, defeating Andrew and Melissa Fisher of Greenwich in Button Fly, which came in second. Soverel 33: The regatta hosted the Soverel 33 class National Championship, won by G. Mark McCarthy of Westbrook, CT in Slainte, besting Darien’s Tom Griffin in Mischief as well as three US Merchant Marine Academy midshipmen racing out of Kings Point, NY – Stephen Webster, Scott Johnston and Ethan Neubelt and their crews. Atlantics: Westport residents took two of the three top spots in the Atlantic class, a fleet that has been a mainstay at CPYC for more than half a century. Westporters Scott Reichhelm and Ron Marsilio came in first and third respectively. Mark Foster of Southport was second. Etchells: International sailing competitor Ched Proctor, a CPYC member from Southport, and his son Charlie won the Etchell class, followed by Kevin Grainger of Rye, Michael Gavin of Westport and Steve Girling of Westport. J105s: Paul Beaudin of New York was first among the J105 class, followed by David Willis of Huntington, NY. George and Alex Wilbanks of Westport were fourth. J109s: David Rosow of Southport finished first in the J109s, followed by Bill Sweetser of Annapolis, MD and Carl Olsson of New Rochelle. Beneteau First 36.7: William Purdy of NYC won in his Beneteau First 36.7, the largest boats in the regatta, followed by Alistair Duke of Wilton. William and his boat, Whirlwind, won this year’s Rex Marine Trophy for the Best Overall Performance in the regatta. J88s: Iris Vogel of New Rochelle won the J88 class, followed by Mike Bruno of Armonk. 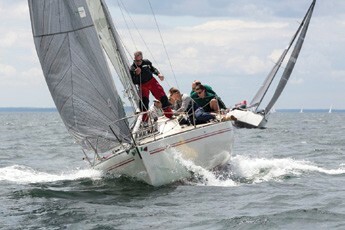 CPYC encourages amateur sailors and gives a special Corinthian Team honor to those who race non-professionally. 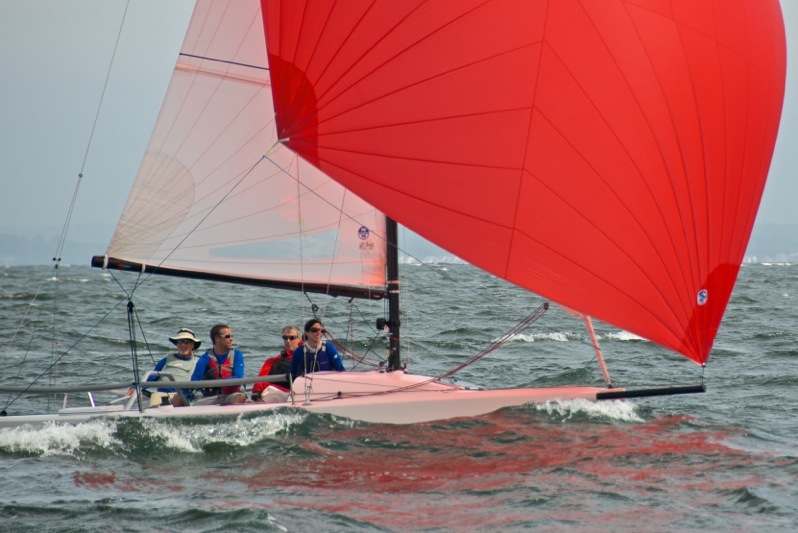 Nine of the 17 J70 teams qualified as Corinthian, and the winners were Andrew and Melissa Fisher of Greenwich (LEFT), followed by CPYC member Trevor Roach of Darien and Carrie and Ed Austin of Ridgewood, NJ. The 2016 regatta is presented by North Sails, Title Sponsor, as well as these valued sponsors: Fairfield County Bank, Dragone’s Auctions, Stew Leonard’s, Coral Reef Sailing Apparel, Landfall Navigation, Gill, McMichael Yacht Brokers, and Black Rock Yacht & Athletic Club. Support is also provided by Community Partners Rex & Cove Marine, Save the Sound, David’s Cookies, Arthur Schuman, Gowrie Group and Harken. Sailors for the Sea attended to help CPYC run a “clean regatta.” Clean Regattas is a certification system that enables sailors to protect local waters with 25 Best Practices that make sustainability approachable and easy. This program is an effort by Sailors for the Sea raising the bar for environmental sustainability and ocean health around the world.